his is the PHP side of the code for this page. Most of the functionality is hidden in the ForumPage object, obviously. 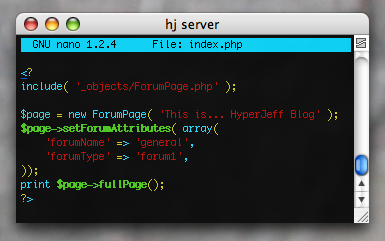 The forum type "forum1" is the simple forum style below. The comments and the general form of the page are held in the template page which has, as is my way with such things, absolutely no code or pseudo-code. This allows me to keep the design of the sight completely separate from the code that runs it. There will be much more talk about this system in the months ahead, assuming this project lives on beyond its first few hours of enthusiasm.